Performers include: Lee Pace, Scoot McNairy, Mackenzie Davis, Kerry Bishé, Toby Huss, and David Wilson Barnes. This fictional drama takes place in the early 1980s, roughly one year after IBM cornered the computer market with the release of its first major product. The title refers to the term for computer machine code instructions that cause a computer’s CPU to cease meaningful operation. A hard-driving former IBM sales executive, Joe MacMillan (Lee Pace) oozes charisma. He shows up at Cardiff Electric and essentially bulldozes his way into a senior position on the sales team. Once he has the job, he orchestrates a plan to reverse-engineer the flagship product of his former employer and build something better. A once-promising engineer, Gordon Clark (Scoot McNairy) is sleepwalking through his life until the day Joe approaches him with his plan. Gordon longs for a redo of his past following the humiliating (and very public) failure of Symphonic, a computer he created with his wife which failed to turn on at the computer industry trade show COMDEX. After that traumatizing experience, Gordon reluctantly moved his family to his wife’s hometown of Dallas and took a job at Cardiff that’s far below his abilities. Gordon’s wife is Donna (Kerry Bishé). Her parents are entrepreneurs who founded a high-end gadget company (à la Sharper Image) called Razor’s Edge. An accomplished musician, she found her calling in computers while attending the University of California, Berkeley, with Gordon. Though she’s resigned to her husband’s being mentally absent following the Symphonic failure, she fears that the new Cardiff project will result in the end of her marriage. A volatile prodigy who puts her future in jeopardy by dropping out of college to join the rogue PC project, Cameron Howe (Mackenzie Davis) is a shock to the system of conservative, old-guard Cardiff Electric. At 22 years old, she represents what is next in the world of computing and a slap in the face to the traditionally male-dominated 1980s tech industry. The product of a tumultuous childhood, she sleeps at the office, takes stuff from others’ desks, blasts punk music, sleeps with her boss Joe, and butts heads with Gordon. John Bosworth (Toby Huss) is a dyed-in-the-wool Texan and old-school businessman who has spent the past 22 years building Cardiff Electric into a regional power. As senior VP, he runs the company’s day-to-day operations and finances for founder emeritus Nathan Cardiff. After Joe forces the company into the PC race, Bosworth keeps a wary eye on the interloper who will either make Cardiff into a tech powerhouse or a national laughingstock. What do you think? Do you like the Halt and Catch Fire TV series? Do you think it should have ended or been renewed for a fifth season? Halt and Catch Fire is one the best shows I’ve ever watched! Please, AMC, bring it back at least one more season. The end of season 4 could easily be continued. Kudos to all who contributed to the making of this excellent TV series. This excellent series was one of the best ones on modern television! Every single Actor was extraordinary (kudos to the smart Casting Director) and the authenticity of each character was stellar. I’m utterly bereft this won’t be back for there are myriad story lines still waiting to be born to show the advancement of technology and social media in its formation. 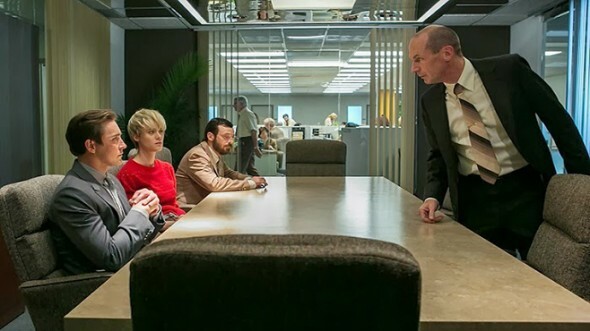 Hopefully there are future-thinking brains to be found when “Halt & Catch Fire” Executive conversations occur. Bring back the Algonquin Round Table of Nerds! It was a fun show but the material kinda ran its course from a real world perspective. What was left to show, I.T. folks losing their jobs to under skilled India contractors that worked for a fraction of a living wage due to H-1B? I found it to be a very good series, very good. It should have been renewed for that fifth season! H&CF is so damn good – I laugh, I cry, I am amazed at each and every episode. I have not watched the last episode yet – I am saving it for “me time”. I am so disappointed to see it end. If it would continue for another season, or seasons, I would be absolutely thrilled !! Great writing, wonderful acting – and nostalgic. Please keep it going. Love the show can,t wait till next season. Please renew it for 2017!